No. 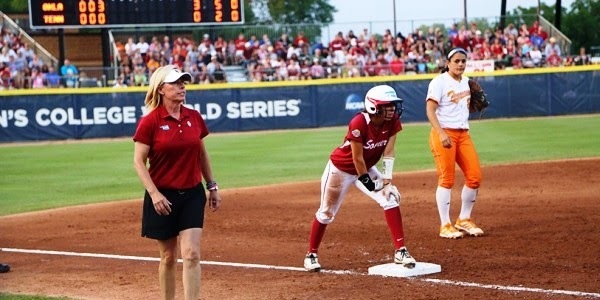 7/7 Oklahoma (45-7, 15-1 Big 12) won the 2016 Big 12 championship outright Sunday after a 10-1 win in five innings over Texas Tech (23-32, 6-12) at Marita Hynes Field. Oklahoma clinched a share of the conference title Saturday, but won it outright with Sunday’s victory. Second-place Baylor is 13-4 in the standings with one game remaining, while OU is now 15-1 with two games to go. It’s the fifth straight league crown for OU; no other Big 12 program has won more than two in a row. Overall, Oklahoma has now won nine regular season titles and four tournament crowns. Second place belongs to Texas with eight combined league titles. OU has won 20 straight games, which is tied for the fourth longest streak in program history. It’s the longest run since winning 23 in a row from Feb. 9 to March 4 during the 2007 season. Additionally, OU has won 27 of its past 28 contests. Oklahoma scored four runs in each of the first two innings and added two more runs in the third to record all its runs. It was the second time this season that the Sooners scored eight runs over the first two innings, also doing so against Western Michigan on Feb. 20. The 10 runs over three innings was OU’s second highest output over those innings, bested only by 11 runs in the first innings against Lamar on Feb. 13. Senior Kady Self, sophomore Nicole Pendley and freshman Shay Knighten each had two hits in the win. Self also drove in three runs, while junior Macey Hatfield and freshman Caleigh Clifton each had two RBI. Senior Kelsey Stevens and freshmen Jayden Chestnut and Brittany Finney combined on the victory. Chestnut was credited with the win, improving her record to 9-0. She gave up one run in 2.1 innings of relief with one strikeout and three hits allowed. OU exploded for four runs in the bottom of the first, its highest scoring opening inning since also scoring four runs against BYU on March 11. After extending her on-base streak to 26 games with a walk, Clifton was on first base with two outs. Knighten then dropped a single into shallow right-center before fellow freshman Fale Aviu was hit by a pitch to load the bases. Pendley batted next and hit a slow roller to short on a 2-2 pitch. Not only was Pendley able to beat throw from shortstop Brooke Scott, but she moved to second and Aviu took third when Scott’s throw was low and wide to first. Clifton and Knighten scored on the play to give OU a quick 2-0 lead. Self added to the lead when she drove the eighth pitch of her at-bat to right center, plating both Aviu and Pendley to make it a 4-0 game. Oklahoma doubled its lead with another four-run frame in the second inning. Senior Erin Miller singled through the right side, and on the very next pitch Clifton homered to right-center for her fourth homer of the season. Two batters later, Knighten singled to center and moved up to second on a wild pitch. Aviu then made the lead 7-0 with an RBI single. Pendley followed Aviu’s single with one of her own, while Self hit her second double of the game to drive home Aviu and make it 8-0. OU tacked on two more runs in the third when junior Macey Hatfield delivered a two-out, two-run double to right-center. Texas Tech scored its lone run in the fourth when Susan Welborn hit a solo homer. It was just the third earned run given up by OU pitchers over the last 11 games. That works out to a 0.30 earned run average during those 71.0 innings. The Sooners close out the regular season next weekend with two Bedlam matchups. Friday’s game is in Stillwater at 6 p.m., while Saturday’s contest takes place in Norman at 2 p.m.